The taste that the Ninja 300 gave me in the past, i was sure, this thing is going to be my next motorcycle. I continue to do the aforementioned items on my Duke 390 even in 2018. Why? 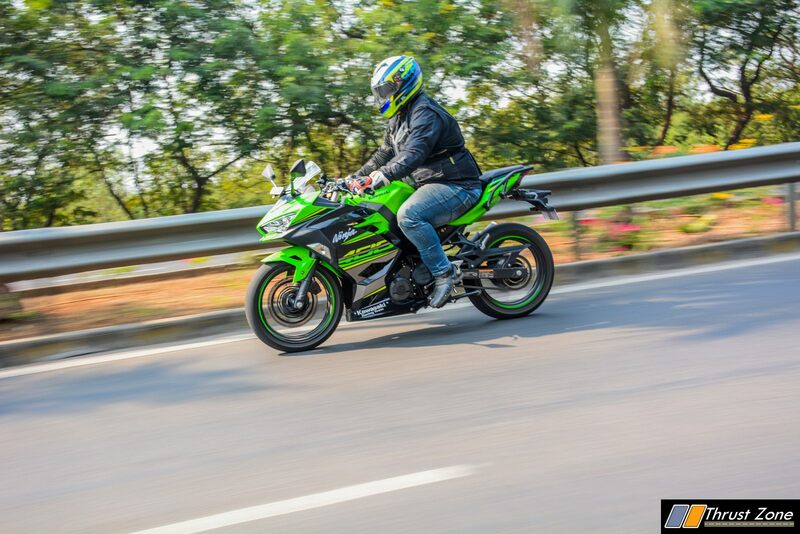 Because the Ninja 400 is priced at Rs 5.80 lakhs on-road Mumbai. Usually, we mention the price in the last, but had to do it first. Why? Because everything else has been taken care so beautifully that we cannot wait to explain you in detail. In terms of design, it continues with typical Ninja design. Chiselled front mudguard, a very substantial looking front headlight cowl and has the right amount of edgy-ness. The large protruding fairing with vents on it makes it grab a lot of attention. The KRT livery makes it look the perfect futuristic Kawasaki Ninja Supersport as always. The tail section is quite muscular and unlike any other Kawasaki. The cluster is now very informative and there is perfection here as well. An analogue tachometer is always welcome for that traditional feel and it gets a digital speedometer too. Fuel efficiency parameters are on offer. Trip, odometer, clock and tell-tale lights are seen on the right and left side of the cluster respectively. The hazard light button would have been welcome which is missing. Rest of the buttons, switches and function in terms of quality and feel are really good. You get LED lights in the front which are good enough when it comes to spread and illumination. Again, Ninja has been boring to ride, this where KTM has an excellent lively engine and chassis setup which the Ninja always lacked. However, this time its different. What has taken us by surprise is the stellar ride and handling package. The rear suspension is mounted directly to the chassis, unlike swingarm mounting which is a cheaper way to do the suspension. Lower centre of gravity makes things stable at any given point of time and the feedback is great. Wish the front suspension was also feedback rich which it isn’t because of the telescopic forks being used instead of USD. Indians can complain this time because the pricing is too high to not get USD’s. We encountered panic braking at very high speed and the motorcycle stopped in its line and very quickly as well. Lever feel is good and progression post initial bite is spot on as well. Tyres also are very good over the past IRC and Bridgestones with the new Dunlop Sportmax tyres. However, we can imagine this bike being off the charts with premium Italian rubber. A chassis which respond very well, is agile, confidence inspiring at the same time and a relatively short wheelbase which provides stability at high speed is a great balance we are happy to see on a Ninja. Clearly, Kawasaki has taken the benchmark of the segment seriously and given us everything possible. Feature loaded motorcycle which is high on quality, refinement, reliability which is genuinely fast, fun and not boring to ride. It looks good, gets essentials and safety equipment and has the genuine touring ability too despite the tank is now 14 litres instead of 17 litres.